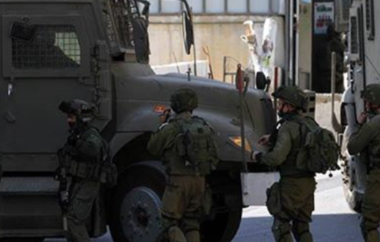 Dozens of Israeli soldiers invaded, Saturday, Palestinian homes, stores and barns in the southern West Bank governorate of Hebron, and installed a roadblock, south of the city. Media sources said the soldiers invaded and ransacked homes in the ash-Sheikh neighborhood in Hebron city, and occupied the rooftop of a home, owned by Nidal Abdul-Jawad Natsha, before using it as a military monitoring post. They added that the soldiers also invaded many stores in the city and interrogated the residents while inspecting their ID cards. Furthermore, the soldiers invaded and searched barns owned by Kayed Ibrahim Makhamra, in addition to one shop, in Yatta town, south of Hebron. The soldiers also installed a roadblock at Yatta town junction, south of Hebron, before stopping and searching dozens of cars, and interrogated the Palestinians while inspecting their ID cards. In related news, a group of illegal Israeli colonialist settlers attacked, on Saturday evening, a Palestinian woman and her son near their home in Tal Romedia neighborhood in Hebron city.